Tea and coffee play an important role in our day to day life. I always preferred tea as my drink more than coffee. Tea has a lot of health benefits like it contains antioxidants, has less caffeine than coffee, reduce the risk of heart attack and stroke, protects bones, it is calories free. 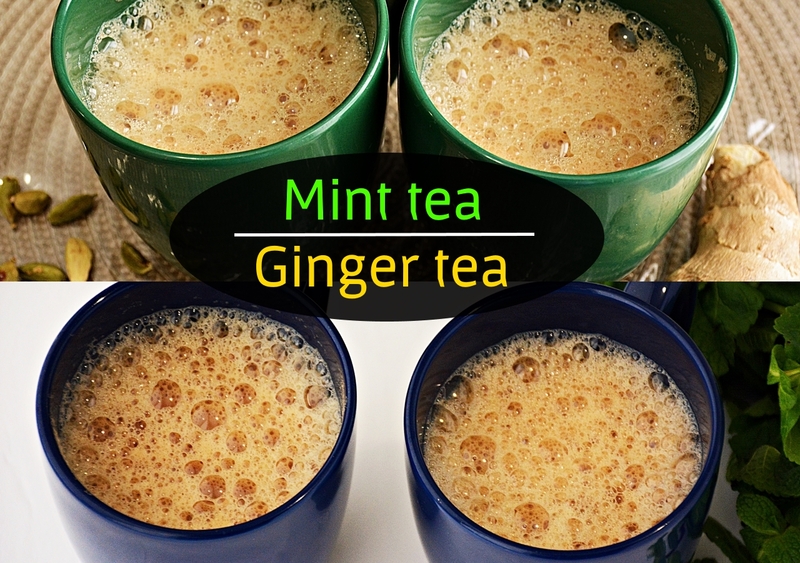 In today's post, I am going to show everyone how to prepare tasty Ginger tea and Mint tea. Heat a pan with 2 glasses of water and bring it to boil. Then add the washed mint leaves and crushed cardamom. Followed by 2 tsp of tea powder and bring it to boil. 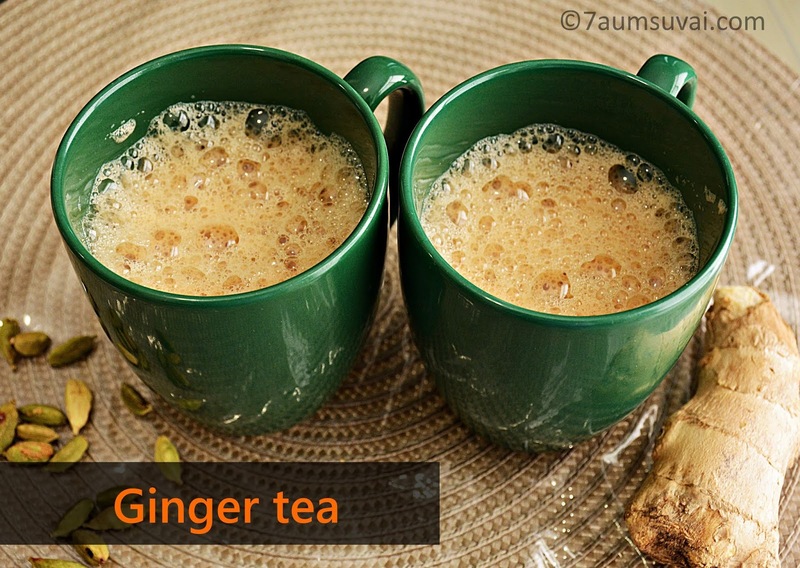 Do not boil it too much, just wait for 1 to 2 minutes to reach the tea color. Then add 1 glass of milk to the tea mixture and continue to boil until you see frothy on sides. Add 4 tsp of sugar (add as needed) and give a good mix for the sugar to dissolve. Now simmer the stove for 5 mins until you reach strongest and good tea color. Filter using a tea strainer and serve hot. Heat a pan with 2 glasses of water and bring it to boil. Then add the crushed ginger and cardamom. Followed by 2 tsp of tea powder and bring it to boil. Increase or decrease the quantity of tea powder as per the strongness you need. Mine was not that strong so, I had used 2 tsp of tea powder. You can add sugar as needed for your taste. Since I had used organic pure sugarcane sugar( not sweet like our regular sugar), I have added 4 tsp sugar for 2 people (each 2 tsp). 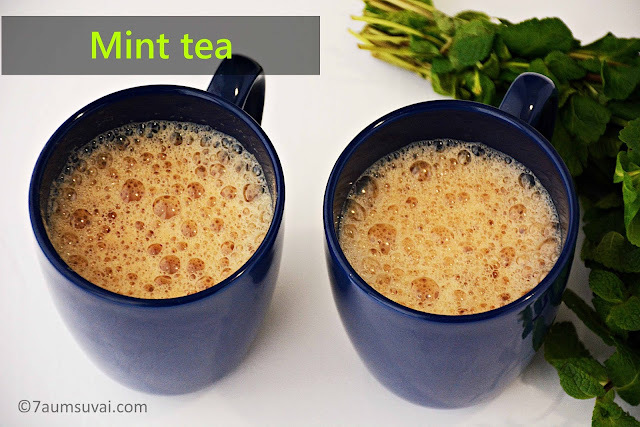 You may always replace fresh mint leaves with dried mint leaves, but you will surely find the difference with taste and also with flavor. I have used regular sized glass in this recipe which was the perfect serving size for 2 people. You may use any cup of your choice, but the ratio should be 2:1 (Water: Milk).